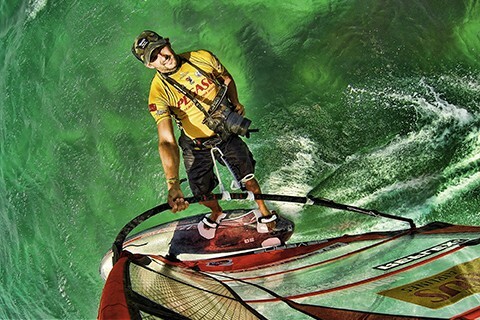 The art of the selfie is a modern must have skill for a pro windsurfer but the technology they use is far from the preserve of the elite with the market for POV cameras encompassing and catering for amateurs to PWA legends. 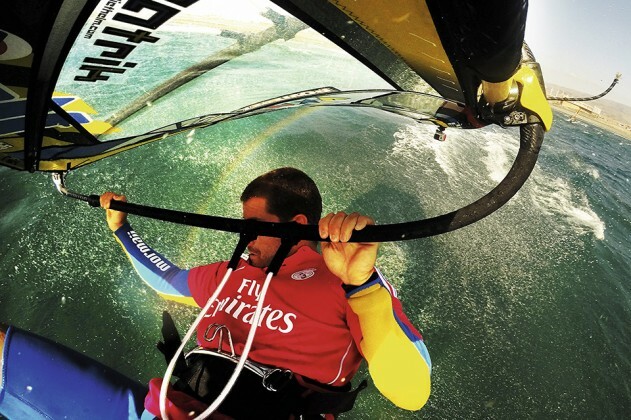 So if you’re struggling with your selfie or are keen to hear just how the pros nail their trick instagram shots, read on as we quiz some of the finest windsurfing selfie shooters on the planet for their tips, tales and tricks of the trade! The advent of the Go Pro and similar point of view cameras has dramatically changed the way photographers and videographers are able to approach mast mounted and boom mounted photography. Gone are the days of punching holes through a sail with a screwdriver to attach a 3 kilo homemade contraption containing an expensive DLSR camera. I remember watching some of the most talented sailors on the planet look almost like beginners, crashing every single jump with this huge, heavy box totally compromising their sailing style. Yes, the Go Pro pretty much made the traditional mast mounted camera obsolete in a matter of years. Not only have they stepped up the quality but as each model is released the cameras are becoming smaller, lighter and easier to use. 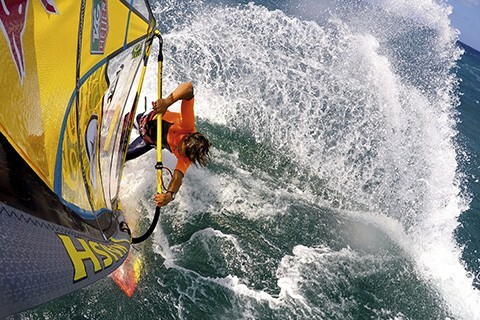 Nowadays Go Pro’s are pretty much everywhere you look and being used for every radical sport. I recently read founder Nick Woodman floated shares in the company and is now worth over 2.5 billion dollars, yep no typo mistake here that is billion not million! Now that is what I call a result! I have had my fair share of trials and tribulations with Go Pro’s and have lost a few after heavy crashes and bail outs, which all could have been averted if I had simply tied the flymount to the top of the mast with spectra or fishing line. That is simply me being lazy, even now I rarely tie them on so only have myself to blame if I lose another one! What I will recommend though is making sure you have the camera set up at home before you head to the beach. There is nothing worse than being on the edge of the water scrolling through all the menus trying to find the multi shot mode or whatever while your rider is itching to get out on the water. I tend to use the time lapse continuous shooting mode for pictures which I believe fires of a frame every half a second. As for keeping water off the lens I have tried all sorts but never found a magic formula to keep every single drip off of the tiny port in front of the lens. I like to tell the rider to make sure they go big on the first jump when I am pretty sure the lens will have no drops on it and then come in at regular intervals so I can check everything is ok. For flat water, spots on the lens are not so much of an issue but I usually advise the rider not to dip the mast into the water before they head out. Wave riding and jumping shots can both look awesome from the Go Pro and although the quality of the shots might not quite be up to that of a full blown DSLR camera, the ease of use and portability of the Go Pro makes it a no brainer! My advice is to keep experimenting, with different angles, from the mast I tend to point the camera towards the harness lines, but if you want to see more of the board in the shot, it sometimes work to have the camera pointing more angled around the mast. Yep the Go Pro sure is a wonderful device and all I can say is I wish I had thought of it, I could do a hell of a lot with 2.5 billion dollars! • GoPro Roll Bar mount: Prime spots to put the mount are the end of the boom as well as the front of the boom. As for the mast, I like this mount for the tip top of the mast. Another prime area is on the mast sleeve cut out just above the boom. This mount is low key; it does not affect my riding. But I like the fact that I can add the pole extension to get the camera some distance from me. 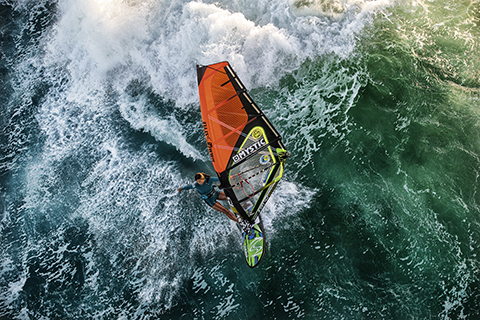 • Flymount: I like this one for about mid way up my mast. It’s nice to not have to cut a hole in the mast sleeve in order to get the shot. • ProMount Mouth Piece: This one is awesome because you can get a great POV but you can always spit it out and hold it in your hand for a selfie. I find the most consistent best shots happen all the time when just holding the camera. 1. Don’t get them wet! The best photos you can get off your GoPro are when you do your first couple of runs before the camera gets wet. The batteries inside them heat up after use and against the cool water of the ocean they fog up quickly or might have a lot of water droplets on the photo. I always find the best photos are from the first run while it’s still dry. 2. You can get some good angles from them by attaching your GoPro to a spare mast and having someone hold the mast upright out in the water and sailing underneath it. 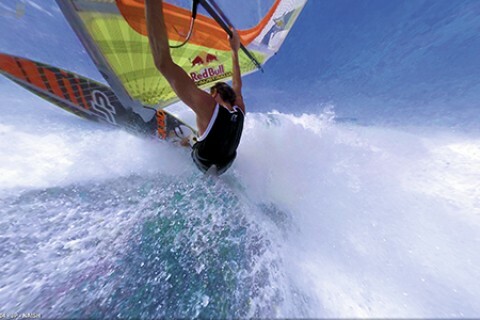 With the fisheye lens of the GoPro you get a very cool wide shot of the beach and the sailor underneath it. 3. After you’ve done a few runs, go back to the beach and open the case and wipe it with a dry cloth inside and out. This lets the warm air out and stops them fogging up (and also removes water droplets). 4. For the best shots, use them in the midday sun (11am-2pm) when it’s REALLY sunny as the GoPro’s get nice colours. 5. Make sure when you set it up as a mast cam to take a photo of something first, about the same distance as your subject is away; the GoPro will set the focus and aperture automatically to that point. I see a lot of people stick their face in front of the GoPro to check the settings are right and the camera sets itself up to take a photo of something only 30cm away instead of you sailing which might be 2.5m away and makes the focus wrong. For attachments I only use the FlyMount which attaches to the mast and the boom. When I setup my GoPro, for photos I use the highest resolution available and for video I mostly shoot on 60fps at 1080p. I don’t use any solutions to keep the lens clean because whatever I’ve tried it still fogs up, so I still think the best strategy is to get your photos on the first run when it’s still dry, then come in and open the case and wipe it inside and out with a dry cloth and go again. Opening the case for a few seconds will stop the fogging. If you’re using the GoPro as a mast cam, the best is to use it during the midday sun as it’s usually overhead so you don’t get the shadows on your face or body as much as when it’s the afternoon sun. I find I end up taking 700 photos to only get one I like – a pretty bad strike rate! Normally I use my Go Pro on the mast with the Flymount mast mount when I’m sailing and sometimes on the boom as well, but lately I have lost a few on my drone and last month in Maui I landed so hard from a table top that the cover of the GoPro broke and I lost the GoPro underwater on my first jump out, Antoine Albeau saw everything and was laughing so hard hahahha, but the guys from GoPro gave me a new one! Last year in Pozo I put the little mount for the nose of the board on a brand new GoPro and landed a small backloop on the nose and I didn’t know I had to put a little lock on it and lost it on the bunker and couldn’t find it!, I was so pissed, I swam for like 3 days to find it and couldn’t!! Between this and the drone I’ve lost a few but I normally don’t tie it, haha, too lazy. I like using the mounts on the boom and also on the board. To keep the lens clean, I try not to fall ha ha and there are some different lens repelling fluids. I also use sun screen or just put the camera under water before using it, you need to do this every few minutes I’ve found. My tips for POV cameras are always cool down the housing and camera body otherwise there is a good chance of condensation building up especially in warm water areas. I always use the air conditioning in the car. If I don’t have that luxury I use alcohol wipes. I ALWAYS travel with the battery out of the camera. I don’t know how many times they have accidentally turned on from moving in my bag. Always take your time!!! Check you have the right settings and check the memory card. Recently I worked with the 360 GoPro cube attached to my harness and I got some sick shots. 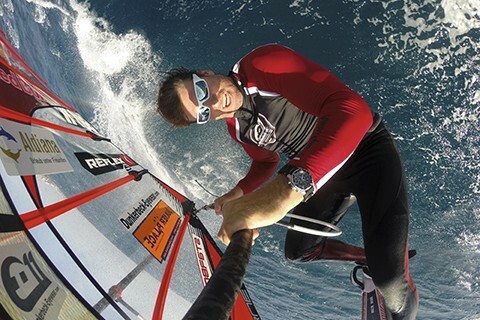 One of the funniest POV shots I captured would be at Cloudbreak recently where I had the GoPro attached to my gear and I was sitting on the back of the ski as there was not much wind and the current was super strong. We were close to the lineup and a huge 20 foot close out set came through, the guy on the ski panicked and took off and I just barrel rolled with my gear and the Go Pro caught all the carnage! It’s the closing scene on my latest Cloudbreak JP Chronicles video! My best tip for POV cameras is mix it up so when you’re making a video use all the angles. I use a K4 harness mount for jumping shots, a head cam for filming others, a nose cam for wave riding and big back loop shots, a boom cam for facial expression shots and finally a mast cam for a really good all round angle and telling how bald you’re getting! For me the best POV camera angle is the K4 mount (harness mount) especially for jumping. You really do get a unique view, kind of like a little drone following you around very closely. As it’s not that easy sometimes to get someone to film you…this angle is the best for learning and working out what you’re doing right or wrong. Plus you get some pretty cool jumping screen grabs. I have a couple of great landing shots from back loops where it looks like I’m totally submerged!! I really didn’t know I went that deep! My worst POV camera moment was when I taped it to the nose and first run out busted out a big backie and after the landing looked down to see no camera!!! Dived in straight away.. but it was Australia.. sun going down and I couldn’t see anything!!! Spent 1 hour swimming but nothing… also on the early K4 mount I had the stick break and had to swim for my life to get it in massive waves!! My favourite POV would be the K4 harness mount. It is like having someone following you with the camera at all times.. all the way through each move. You don’t feel it at all so you can fully go for it, but at the same time you get a great angle that helps when analysing moves and also the best alternative to the footage taken from land. My funniest POV moment must be when I captured a bird sh@tting on me when I was sailing a reef quite far off-shore in Australia haha.. right on my shoulder – what are the odds? Apparently it’s good luck! I strongly recommend POV cameras for self-coaching. They are very effective for a few reasons. The first is because you focus on sailing better, as you are aware that Big-Bro GoPro is watching you, and so you will inevitably raise your game. As you can imagine, the footage shows exactly where your hands are, and where you are looking all the time and with no excuses, the camera tells no lies. It is important to understand that first you must know what you are looking to see on the screen. 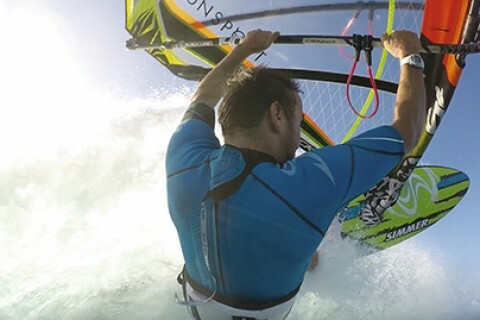 So I suggest you brush up on the suggested basic head, hands and hip position (the 3 vital H’s in many moves) for all your windsurfing antics. This is a big benefit as you begin to research and already glean important tips on how to sail better! Next you can begin to view and post positive pics of yourself and this success helps breed confidence and in turn progression. Lastly, if you edit the footage and document it, then you get a comparison of your sailing over time and it helps you assess how your targets are being met, or not, and furthermore gets you to identify what to do to actually move forward. This edited footage can also be seen by a nice friendly coach like me, and can advise on the positives to take from it, and your opportunities to improve.